The group is composed of MARMI SCANELLA, S.I.M.G. and the LA QUADRIFOGLIO MARMI E GRANITI S.R.L. The MARMI SCANELLA and S.I.M.G. companies are ISO 14001 and CE Mark certified, they have their own quarries and processing plants, and they account for about 60% of the total production of Orosei marble. Mining capacity is continuously expanding from both a technological and productive point of view. LA QUADRIFOGLIO MARMI E GRANITI S.R.L. is the commercial subsidiary of the group, it has its strategic headquarters in Verona, an important hub for the marble industry. Thanks to our considerable experience and high technical and commercial organisation. 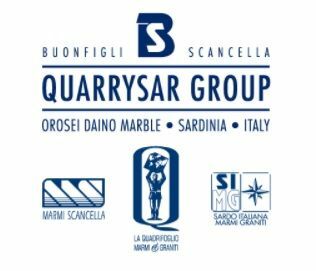 The BS QUARRYSAR GROUP distributes its key products throughout the European and international markets.